For a fun and out-of-the-ordinary wedding, consider Las Vegas. That's what two Australian couples did Thursday and The Early Show's Melinda Murphy was there to witness it. "If you're in Vegas you might as well get married by Elvis," said Corey Garratley. It was his idea and his fiancé Julie Craft said yes. "She must be the right girl if she'd come here to get married," he added. "We aren't especially big Elvis fans. But it's just stuck in our mind, coming to Vegas," said Julie. Corey's buddy David Lawton also thought it would be neat to tie the knot at Viva Las Vegas Chapel. Their union will come as a surprise to friends Down Under. "I called my mom about two hours ago to tell her I was getting married. But we knew for three months we were getting married," said David. His bride-to-be, Jennifer Dugdale, was nervous about telling family. To adopt each other's hound dogs. And to give each other a-hunk a-hunk of burning love. By the power vested in " the king," Elvis pronounced them husbands and wives. "Gentlemen, you may kiss your lovely brides," he concluded the ceremony. 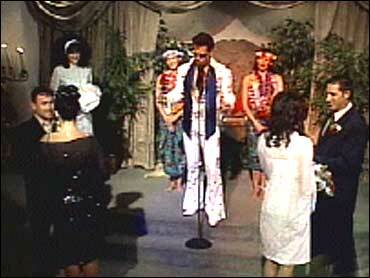 The music was "Can't Help Falling In Love With You" followed by "The Hawaiian Wedding Song." In the background, "bridesmaid" Melinda Murphy celebrated with two hula girls dancing "Viva Las Vegas." The $700 service came with theatrical lighting, fog, video, flowers, pictures and limo service. If you would like to tie the knot Las Vegas' style, you can choose from a range of ceremonies, from the $400 "Elvis Special" to an elaborate wedding in a reception hall with Elvis and a full band, which could cost up to $7,000. Though Elvis weddings are the most popular, you can get also get all kinds of theme weddings: Camelot, Intergalactic (with a spoof on Star Trek), Victorian, Beach party; Western, Gangster, Gothic and Egyptian. The average price is $600-$700. the State of Nevada..." making it official.